Unlock the more straightforward side of What the Day Owes the Night with this concise and insightful summary and analysis! 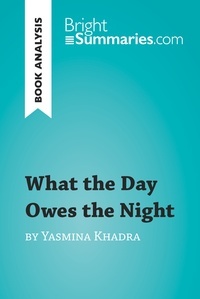 This engaging summary presents an analysis of What the Day Owes the Night by Yasmina Khadra, which chronicles the life of an Algerian boy torn between two worlds: his roots as an Arab, and the pied-noir community he has been adopted into. His quest to discover his own identity and a place where he truly belongs spans decades, during which he forms lasting friendships, witnesses the outbreak of the Algerian War, and crosses paths time and time again with Émilie, a beguiling young woman who might just be the love of his life. Yasmina Khadra is the pen-name of Mohammed Moulessehoul, an award-winning Algerian author. Find out everything you need to know about What the Day Owes the Night in a fraction of the time! This in-depth and informative reading guide brings you: .A complete plot summary .Character studies .Key themes and symbols .Questions for further reflection Why choose BrightSummaries.com? Available in print and digital format, our publications are designed to accompany you on your reading journey. The clear and concise style makes for easy understanding, providing the perfect opportunity to improve your literary knowledge in no time. See the very best of literature in a whole new light with BrightSummaries.com!